If I invite you to dinner at my house (so, if we’ve ever met, because I invite EVERYONE to dinner at my house), there’s a 70% chance I’ve never made the dish I’m serving before. Every “hostess tip list” says this is a terrible idea, lest you screw up/it takes too long/you stress yourself out. I say to hell with that – if my friends are there, even falling flat on my face is fun. But most of the time, I don’t – because I have my own tricks. 1. I always have an appetizer. And let’s be clear, that “appetizer” can be as simple as straight-up cheese or chips and salsa. In fact, if you actually show up on time, you’re probably making the munchie plate. Anyone can unwrap cheese, and everyone feels more at home when they help. (Plus, I totally expected you to be late.) 2. Have a back pocket plan. I can whip up a pretty fantastic pasta with marinara sauce in less than 10 minutes, which covers basically every disaster ever. And let’s be clear – this trial run? Won a gold medal. This pork tenderloin was so good half of us ate dinner standing, because we forgot to leave the island. We ate the “leftovers” with our hands as the night continued – still never leaving the island. 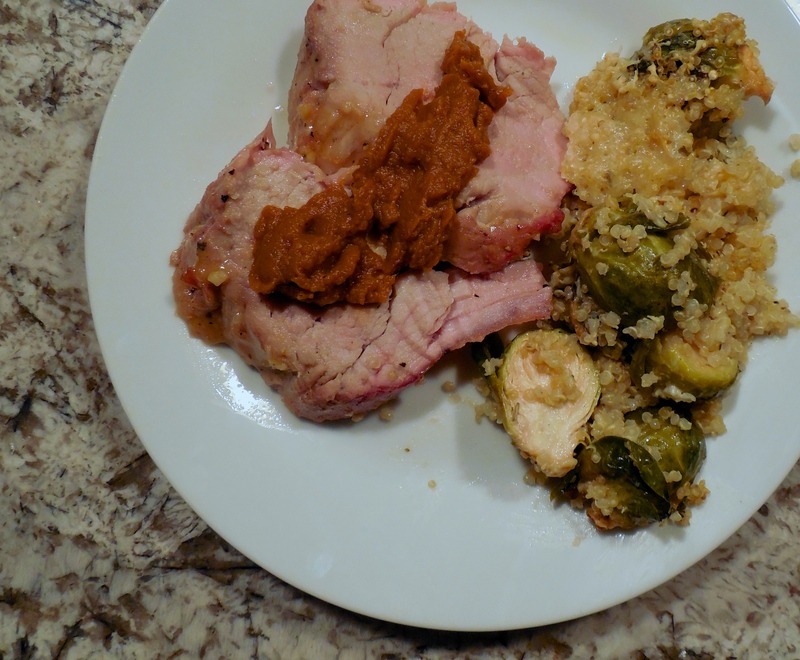 Topped with maple bourbon pumpkin butter and served with roasted Brussels Sprout quinoa bake, the only falling you’re doing is in love. Main course: maple dijon pork tenderloin. We could not keep our hands off it. Yes, I said hands. Forks are so appetizer. Preheat oven to 400 degrees. Mix everything (except tenderloin) together in a small bowl. Brush both sides with 1/2 the glaze and roast for 20 minutes. Pull meat out and brush with remaining glaze. Bake 10-15 minutes more, until thickest part of tenderloin registers 155 degrees. Tent with aluminum foil and let the meat rest 10 minutes before cutting. Serves 6 – no, really, the 6 of us devoured this. Conventional serving sizes may tell you otherwise, but trust me on this. Getting married is an interesting exercise in merging tastes. What you each grew up with plays a huge part in how much you love/hate things like lima beans/Brussels Sprouts/broccoli, or even steak/pork chops/pasta. The hubs and I both came from a lot of casseroles – except he hated most vegetables not in casserole form. I developed a love for cooking in college – and with that came a love of crunchy vegetables, al dente pasta and medium rare meat. David, unfortunately, did not share that love. Luckily, they say your tastes change every seven years. I think I may have David on an accelerated rate, but five years ago, the only part of this dish he would have eaten was the butter. Now, he loves Brussels Sprouts so much I actually think I could have served them on cardboard. Luckily, I didn’t have to. This dish is a great nod to Fall – the cranberries, pecans and brown butter made you feel like the holidays are right around the corner. The roasted Brussels Sprouts give a great crunch and earthy flavor next to the sharpness of the goat cheese, and the pasta just…well, it’s pasta, it makes everything better. David loved this so much he didn’t even ask about meat – which hardly ever happens. 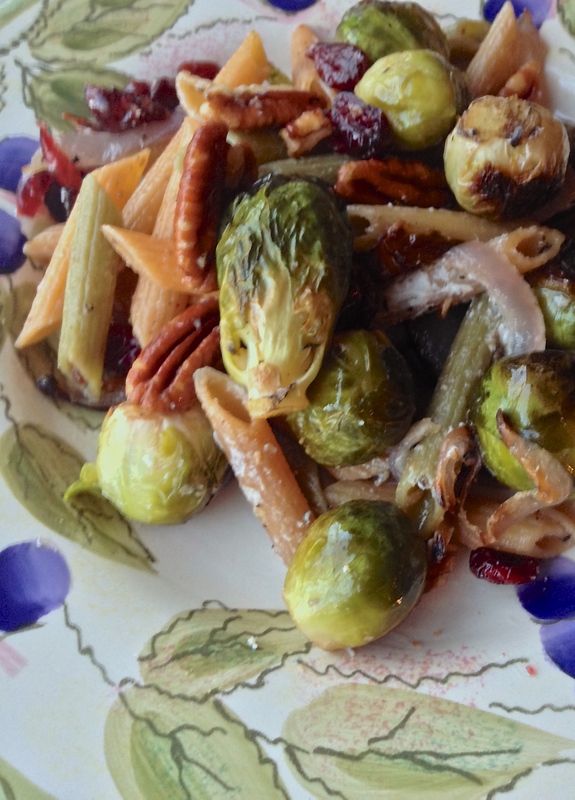 All the best flavors of Fall: brown butter, cranberries and pecans – with yummy caramelized sprouts and pasta. Cook pasta to your liking, drain and set aside. Melt butter in a skillet over medium high heat. Once the butter melts, keep the heat high, cooking the butter until just golden (it will keep cooking even after you turn off the heat.) Turn off heat and add garlic. Toss pasta in with butter mixture, then add sprouts and onions. Toss to mix, then pour into a serving dish and sprinkle with cranberries, pecan and goat cheese. Serves 4 as a main course and 6 as a side. So here’s the deal: yes, making super fancy food can be a super-hella-blast. I like it more than most. But sometimes, I’ve had a long day. I want to come home, put on my jammies and eat something that warms me from the inside out. I want it to be real, wholesome, homemade – and good for me. And cheap-ish is always stellar. (I’m kinda needy, even on jammie night.) So here it is, the warm-you-up, fill-your-heart-without-busting-your-pants-or-budget ultimate meal: roasted chicken. Mashed potatoes. Broccoli. This roast chicken is so amazing we had to show it some love. Seriously, we couldn’t stop sneaking bites – we had to make a whole new chicken! 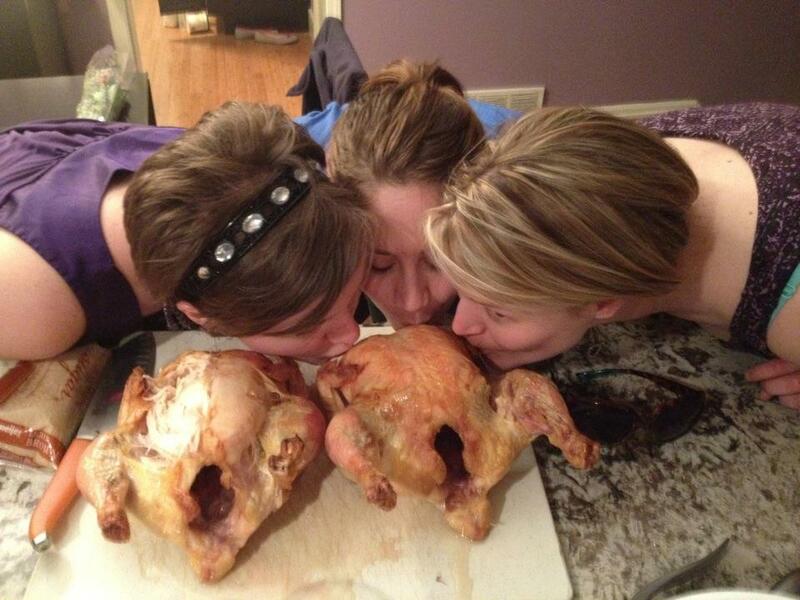 Roast chicken, you say? Well that’s some boring dinner, Amanda. I submit to you, it is not. It may not photograph perfectly (see lack of finished dish photo) but you perfectly roast a chicken with nothing but salt and pepper – I am telling you , your life will change. And mashed potatoes? Do not have to be laden with fat and cheese. (I mean, they’re super good when they ARE, don’t misunderstand, but they don’t HAVE to be.) And broccoli gets a bad rap, but I’m here to tell you, if you make it like I instruct below, you will turn the staunchest of green-things hater into a believer. (And I should know – I’ve done it). So bust out your yoga pants and hoodie, pour a glass of wine and put on the jazz. Or blues. Or teeny-bopper pop, I’m not here to judge. Check inside – if there is a bag of innards, remove and pitch. (And be grateful it’s already in a bag for you.) Pat chicken dry. Preheat oven to 400 degrees F.
Combine green spices, salt and pepper and half of garlic with 1/4 cup oil and rub chicken down. No for real, give it a good massage. Stuff the inside with your citrus fruits, just until it’s full. Some people like to truss the bird (which means tying its legs together so the fruit stays inside). But it’s PJ night and I’m lazy. So I don’t. Now go and wash your hands, or my sister will have a fit. Remove tent in last 15 minutes or so of cooking, so the skin gets all nice and brown. Once you hit the magic number, pull out of oven and cover with aluminum foil tent, resting for 10 – 15 minutes. Meanwhile, back at the counter – your chicken’s in the oven. Broccoli and mashed potatoes won’t take you more than 30 minutes or so. Take a break! Put your feet up, make some tea, read a book. Ok now come back, we still have work to do. Drizzle with remaining oil, half of remaining garlic and salt/pepper. When you pull the chicken out of the oven, pop in the broccoli and roast for 10 minutes, or until it’s really, really green. Boil a pot of water on high. Add potatoes, turn down to medium, cover and cook for 10-15 minutes, until a fork just pierces the potatoes (but they still have some give). Drain potatoes and return to hot pot. Serve potatoes and broccoli with your chicken. I love to entertain – except for those nights. Nights when you don’t want to clean. Nights after a wretched day. Those nights when you just want to cook something soul-warming, put on your PJs, open a bottle of wine – and call your best friends. Because you’re scared of them seeing your house. Even on those awful nights, Merrill will still come over – in her PJs, homework and Oscar (her dog) in tow. My house can be a mess, I usually am a mess – but we make some room on the couch to eat, laugh and relax. 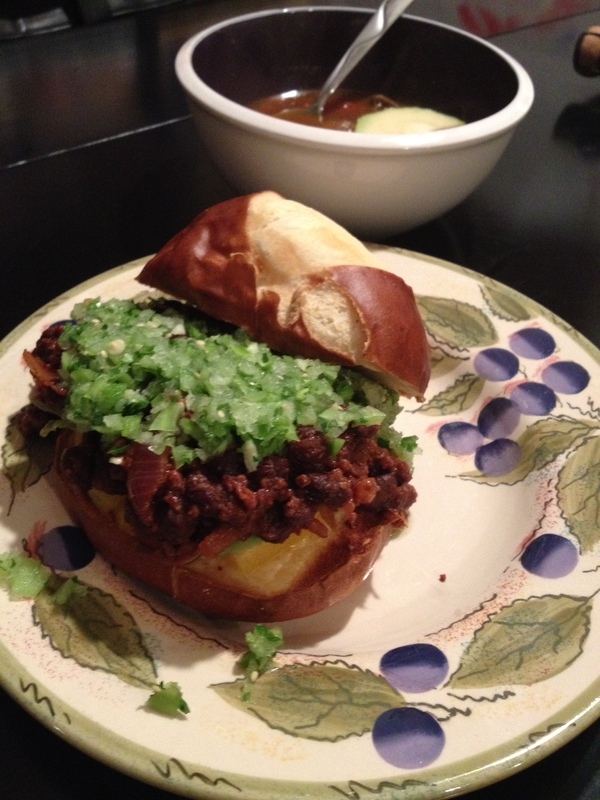 She requested this recipe during a ‘couch date’ – but, as always, we fiddled a bit. It seems like a lot of ingredients, but you’ll probably have most laying around already. 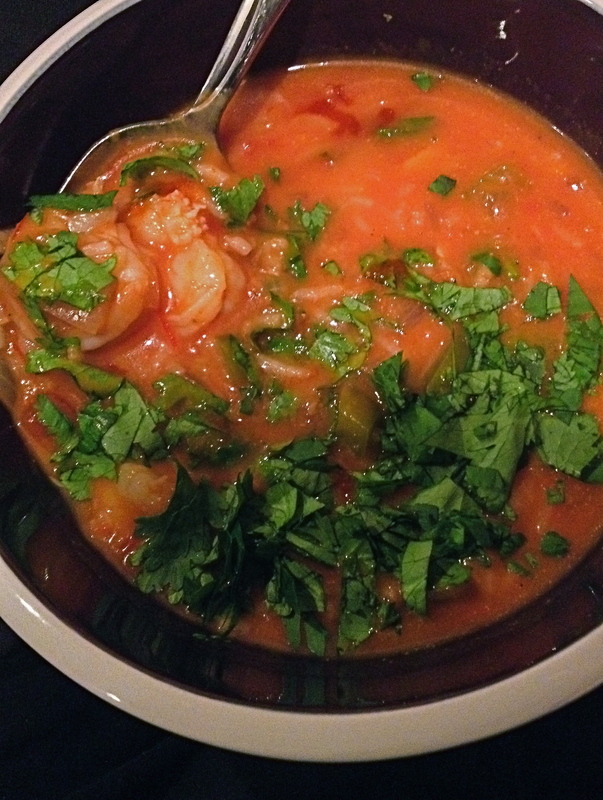 The perfect classed-up comfort food – Brazilian shrimp soup. Add the rice, red pepper flakes, salt, tomatoes, and water to the pot. Bring to a boil and cook until the rice is almost tender, about 10 minutes. Stir the coconut milk into the soup. Bring back to a simmer and then stir in the shrimp. Simmer, stirring occasionally, until the shrimp are just done, 3 to 5 minutes. erve in large bowls garnished with lemons, sriracha and parsley. There is just something about barbecue. No matter what season, what occasion, it seems easy, fun and delicious. The same can be said for pizza. You can make a pizza fancy, fun, heavy, hearty – the combinations are endless. Anyone who knows me knows how I cook – there should be a new term for leftovers coined just for me, to adequately express the level of leftover food I have after any given meal. The conception of this dish was one such occasion. I’m sure you’ve had chicken BBQ pizza (and in fact, my friend Matt makes the world’s best), but we happened to have a bunch of leftover pulled pork after an event, and I thought, “Well, I could make a pizza out of that!” So I did. And then David started requesting it weekly. So I suggest you don’t make this unless you’re ok with it becoming a permanent dinner rotation. To caramelize the onions: slice, combine with oil, brown sugar, salt and pepper to taste. Roast in a 400 degree oven for 30 minutes. Put your pizza stone in the oven with the onions, so it heats up while you assemble the rest of the pizza. Mix half the BBQ sauce with the pizza sauce and spread on the crust. Mix other half of sauce with pork. Add cheese, pork and caramelized onions to the pizza. Try not to eat the whole thing in one sitting. I dare you. Camping is an activity I’ve come to love as an adult. As a child, we went once. I was two. My father left my mother alone with twin two-years-olds and an infant to go to work, and I proceeded at stab my mother in the eye with a fork. Then, as the story goes, it started raining cats and dogs and I think the camper got stuck. Needless to say, we did not camp again. But I’ve been a few times with different groups of people, and when you find a “good camping group,” it makes the whole experience an absolute blast. We found a great group a couple of years ago through our friends Matt and Andy. Everyone was very nice and welcoming, we had a great time kayaking with them. One of their group traditions is dinner in a foil packet – basically, a bunch of different veggies and whatever meat and seasoning you want, wrapped in aluminum foil, grilled over the fire until the meat’s cooked. I can’t remember which one of the boys came up with which meat option, but we decided to bring shrimp and chorizo. It was a brilliant choice. The fat from the chorizo gives the veggies great flavor (and just means you don’t add as much oil) and the shrimp is amazing. It does tend to get a little done, so we leave it on the top. Or you could always throw it in at the end – that’s probably a better idea. And while we cook these over a fire, you can absolutely do them on a grill or even in the oven at about 400 degrees. We’ve done them all, because we just can’t get enough. 1. Get your heat source going, whatever that may be – a fire, a grill over medium high heat or an oven heated to 400. 2. Spray 4 foil pouches or pans with non-stick spray, to help keep everything from sticking. 3. Layer in your ingredients – potatoes on the bottom, chorizo next (make sure you break it up with your fingers), veggies on top of that and shrimp on the very top. 4. Drizzle with a little bit of olive oil, if desired, and add seasoning as desired. 5. Cover top with foil and place on fire grate, grill grate or in oven and cook for about 30 minutes, until potatoes are fork tender. 6. Remove from heat, let stand for about 5 minutes (it will be super hot). 7. Transfer to a plate, stir and enjoy! Also, delicious topped with your favorite cheese.